Just slip the metal prongs into the top of the book (as shown) to show the page you want to keep open, and it will stay open. If there is a page to flip, just avoid clipping that page. So simple. The original, the best on the market! Made of rigid, 18 gauge, gold-plated, tempered, aircraft steel. Guaranteed not to bend under normal use! It measures 2" x 4" and slips easily in the top of any book, no matter how large or how thick it is. Works great on text books and cook books too. Made in the USA and plated with 24 ct gold! 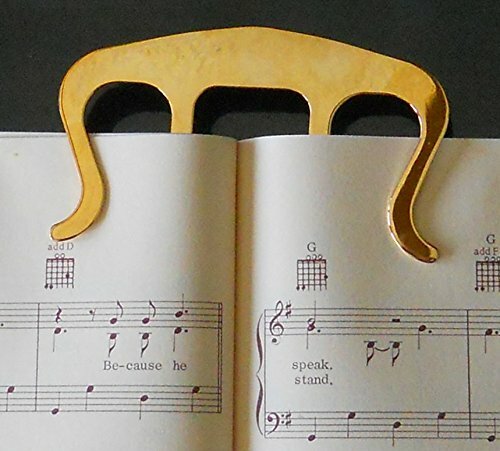 Holds your music book open flat, so your hand are free to play. Hand-polished to a bright yellow gold finish. Comes in a jewel case, great for gift giving. Also works on cookbooks, textbooks, and manuals! Made of 18-gauge tempered steel. If you have any questions about this product by Long Beach Music, contact us by completing and submitting the form below. If you are looking for a specif part number, please include it with your message.